Family Engagement in the Digital Age: Early Childhood Educators as Media Mentors explores how technology can empower and engage parents, caregivers and families, and the emerging role of media mentors who guide young children and their families in the 21st century. 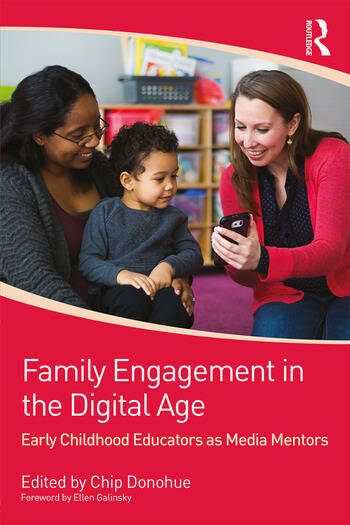 This thought-provoking guide to innovative approaches to family engagement includes Spotlight on Engagement case studies, success stories, best practices, helpful hints for media mentors, and "learn more" resources woven into each chapter to connect the dots between child development, early learning, developmentally appropriate practice, family engagement, media mentorship and digital age technology. In addition, the book is driven by a set of best practices for teaching with technology in early childhood education that are based on the National Association for the Education of Young Children (NAEYC) and Fred Rogers Center joint position statement on Technology and Interactive Media. Tech and Family Engagement Tips from Comienza en Casa. Chip Donohue, Ph.D., is Dean of Distance Learning and Continuing Education, and Director of the Technology in Early Childhood (TEC) Center at Erikson Institute, USA.